“Nigerian Scam” is still working – Police Reports show. I occasionally think to myself; Surely everyone’s heard of the Nigerian Scam (aka Advance Fee Fraud or 419 Scam, after the relevant section of the Nigerian Criminal Code). But, alas, people still continue to fall for these simple scams. The deal is often identical, only the names and places have changed . These places are mainly third world countries that have, up until recently, had a corrupt dictator (is there any other kind?). The scam has been running for many years and offers huge riches for a relatively small outlay – a $100 million haul for a measly $2000 ? it’s chump change/petty cash, right? The targets are often the elderly who are more trusting, can be easily confused and are often ashamed to admit that they have made a mistake and become convinced that if they can send just one more payment, their fortune will be made. MAR 12 @ 8:15 A.M. VICTIM FELL IN LOVE ON FACEBOOK WITH S WHO CLAIMED TO BE KING OF GUYANA. GUYANA AUTHORIES TOLD VICTIM THAT KING WAS INVOLVED IN DRUG TRAFFING. VICTIM SENT MONEY TO S VIA WESTERN UNION. This one has the additional payload of a Dating Scam which makes it all the sadder. The one factor which makes my blood boil is the continued use of Western Union “The Scammer’s Friend” as the best way to part people from their money. That company should be shut down for the crimes it has helped commit. I would like to give a shout-out to a new site that I’ve come across – INFOMERCIALSCAMS.INFO. InfomercialScams.info is a website designed to help the public identify all types of scams and schemes on and off the internet. They also try to help people distinguish between scams and actual deals by providing them with information on all the different types of scams and schemes that the good people at InfomercialScams.info hear about. I had a quick look through and they have identified some new scams that I was unaware of (Video Game Tester, Jury Duty etc). Go see them and tell them Scamdex sent you! I got a comment recently on my blog about a scam that I was unaware of but which, after a small amount of research has made me boiling mad. The Internet is awash with images – mostly pictures of my cat, I admit, but they are everywhere – the World Wide Web is now a massively visual medium, made worse by social sites such as Facebook. The problem is, each one of these images is owned [by somebody] and they often don’t take kindly to anyone else using them without permissions [or payment]. The kings of the Pay-to-use images world are the stock photo libraries – massive databases of images, all of which have complex rules and pricelists depending on how, where and how long the image is used. It ay be 99c to have a thumbnail on your website or many $$ thousands to license an image to print on tee shirts or have as part of your company logo. If you are looking for a picture, say, of a cat playing the piano, you can find many, many of them on any search engine. But each image has it’s own rules about usage. OK, so what, precisely, is a Curbstoner? You know that place on your commute that always has a bunch of cars for sale? the patch of waste ground by the stoplights? That’s almost certainly a curbstone site. Curbstoners are unlicensed vehicle dealers, called as such because they tend to park a selection of cars for sale in popular areas along the curbstones. They operate in this way because a private sale of a vehicle is not covered by the legal restrictions that a dealer must abide by. Best places in the US to get Scammed Online! A report by Symantec (the somewhat self-interested PC Security company) has produced a report that lists the top ten places in the US to be scammed online. The nation’s capital, Washington DC, is top of the cybercrime rankings, mainly due to its high saturation of smartphone usage (second in the country), but the large number of politicos, lobbyists [and all their money] must be a significant factor too. Itâ€™s not all bad news, the study helpfully tells us that the top rated cities for risk of cybercrime are not necessarily the top rated cities for actual infection. Risk elements that make this list are smartphone usage, widespread Wi-Fi hotspots and heavy Internet throughput which is presumably what brought Sacramento into the top ten for the first time. Sacramento apparently scored above average across all cybercrime risk categories. At the bottom of the list are cities such as Tulsa, Detroit and El Paso. Symantecâ€™s conclusions are to beware of using Wi-Fi hotspots for sensitive transactions and to use complex, unguessable passwords for all your online transactions. (and that does not include â€˜abc123â€™, â€˜qwertyâ€™ or â€˜passwordâ€™, Mister!). 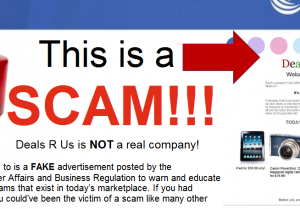 Fake ‘Scam’ Website to Educate Consumers. 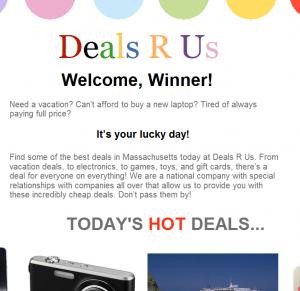 A new initiative has been launched by the Massachusetts Office of Consumer Affairs and Business Regulation (OCABR) to educate consumers about the pitfalls of internet scams. 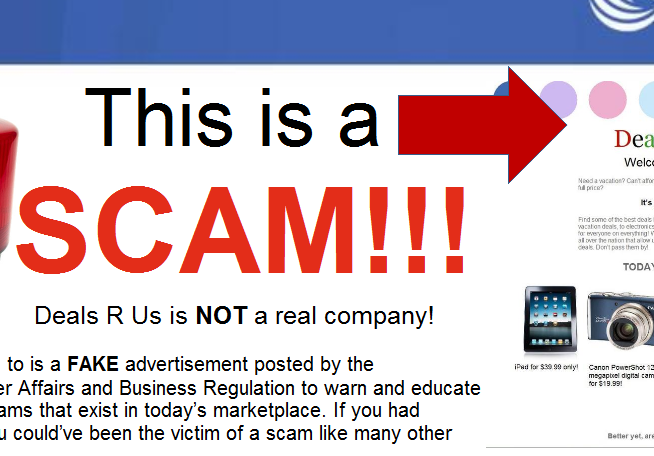 They have recently launched an educational campaign that includes a fake ‘scam’ website. There are two components to this website: the first is a â€œteaserâ€ page that appears to sell the consumer an irresistible deal. It has been modeled to look very much like many of the websites that promise guaranteed results, but in fact deliver nothing in return for the consumerâ€™s money, or result in identity theft of consumerâ€™s personal information. On clicking any of the links to find out more information, the consumer is directed to a second page that reveals that the first page is an example of a scam and is brought to the consumer by the Massachusetts Office of Consumer Affairs. Most importantly, there is information about spotting similar fake advertisements. The website contains valuable information about how to protect yourself as a consumer, and a number of resources to consult if a consumer has become a victim of a scam. If you have any questions regarding this initiative or the efforts of the Massachusetts Office of Consumer Affairs and Business Regulation, contact visit their website at www.mass.gov/consumer. Hiding income in offshore accounts, identity theft, return preparer fraud, and filing false or misleading tax forms top the annual list of â€œdirty dozenâ€ tax scams in 2011, the Internal Revenue Service announced today. The Casper Police Department says that they've been notified of a new phone scam, that may result in bank charges simply by saying the word “hello.”.